Cell Line Authentication are very important in biomedical research and it is a process by which a human line identity is verified. Authentication is required when every time a new line is established or acquired. DNA Forensics laboratory Pvt. Ltd. use standardized techniques which detect misidentified, genetically drifted or cross-contaminated cells that invalidate research results. For analyzing, we use an exclusive pattern to generate repeating DNA for each human cell line, so that each new stock of DNA profile is verified by comparing to the baseline profile. 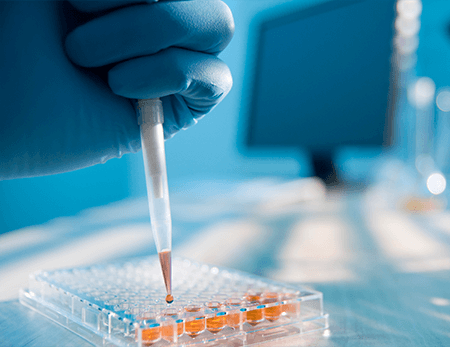 Cell line authentication is an important research tool used in a variety of areas such as medicine, genetics, vaccine development, cell biology, drug discovery, reconstructive drugs, screening and toxicity testing. Many methods have been used to identify cross-contamination in cell culture, such as isoenzyme analysis, karyotyping, human lymphocyte antigen (HLA) typing, and amplified fragment length polymorphism (AFLP) characterization. When is cell line authentication to be performed? The culture is actively growing; hence authenticate it in two months of interval before research publication. Our facility makes STR profiling of human cell lines fast, easy and reliable as well as provide the utmost discrimination methods for cell lines and confirmation of identity, detection of cell cross-contamination and misidentification of cells. The authentication of the cell line makes it possible to discover the relevance of the query line with respect to the reference standard and to identify the possible contamination. The cell line is authenticated using Short Tandem Repeat (STR) profiling, which is one of the most informative polymorphic manufacturers in the human genome. It also helps to ensure the integrity and quality of human cell lines in the scientific community. While tests are always a good idea, your intuitions should not be ignored. When in doubt about the state of your cell lines, contact us at: +91 8010177771 or +91 9213177771. Our executives suggest the best methods for cell line authentication that is appropriate for your needs.